In search of an easy as pie way to relocate your Windows 7 Media Center recorded TV from one location to another? Perhaps a storage drive or a networked server machine? Well, Recorded TV Manager 3 has got you covered. This program is somewhat light on features but it gets the job done if you’re looking for simple and easy. Installation is relatively easy and the latest version has support for the WTV file format native to Windows 7 Media Center. In addition to the ability to automatically move your recorded TV files there’s an included recordings manager with a lightweight series editor included. If that sounds like just what you’re looking for then look no further! Get started by downloading and installing Recorded TV Manager 3 from Drasch Software. Once installed running the program will prompt your to add your initial Recorded TV location. During my initial run I mistakenly selected the desktop and was unfortunately unable to remove this initial selection later on. 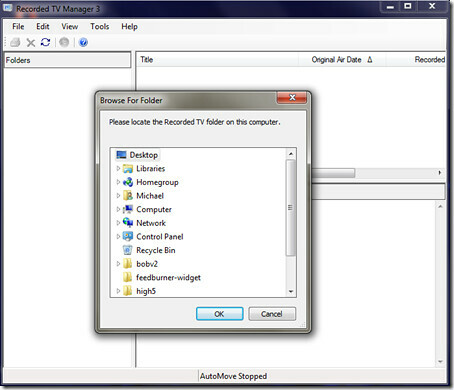 Once you’ve selected the proper recorded TV folder you can begin browsing your recorded series from the Recorded TV Manager interface. In the default view you can browse by location and then by series name. 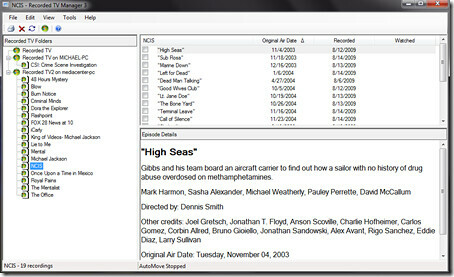 From here you can right-click any episode and choose to move or copy it from the current location as well as view a short display of information on the episode. It also provides a convent method to watch a series in the order that it was originally aired as the date is displayed as well as the last episode you’ve watched.